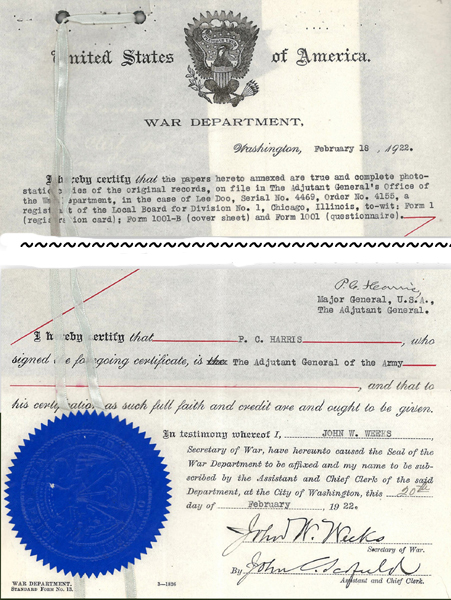 “Seal of the War Department, United States of America, Lee Doo,” 1922, Chinese Exclusion Act case files, RG 85, National Archives-Seattle, Lee Doo case file, Seattle, Box 1391, 41410/13-17. Lee Doo, born in San Francisco on 11 November 1892, was the only child of Lee Jing and Ng Shee. His father was in the Chinese drug business. His parents went back to China in 1899 and sent Lee Doo to Chicago to live with his grandfather, Lee Sing Yin. Four years later his grandfather went back to China and Lee Doo went to live at Wa Chung Sing Company with his grandfather’s brother, Lee King. Lee Doo registered for the draft in Chicago on 5 June 1917. He received classification certificate order #4155, serial #4469 and was classified as 1-a. He served in the U.S. Naval Reserve Force as a ward room cook. He did his training at Great Lakes, Illinois then served on the ship Yantic. He went to France twice, once on the ship Lancaster. After he was honorably discharged in 1920 he moved to St. Louis, Missouri where he worked at the Mandarin Café. His father’s brother, Lee Thou (Lee Woon Fat) was living there. In February 1922 he was applying to visit his mother in China. When he returned in May 1923 he was married and had a son. There is no more information in his file.